Rev. 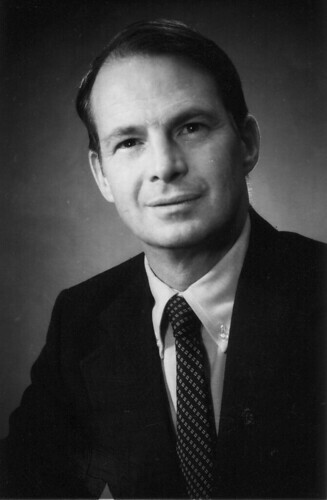 Ronald C. Scharfe served the campus from 1970-1992 in many capacities. However, the one most known for and beloved by the students was beloved Bible teacher. Rev. Scharfe served as a librarian assistant at a few colleges before receiving the call to come to Ft. Wayne Bible College in 1970 as Head Librarian. “That was God’s will and I responded to God’s call.” Although by admission he is a “lover of books,” and enjoyed being Librarian, he had had a long time desire to teach. In 1973 he was asked to teach some courses in Bible, and when asked to come on fulltime as a Assistant Professor that dream became reality. Rev. 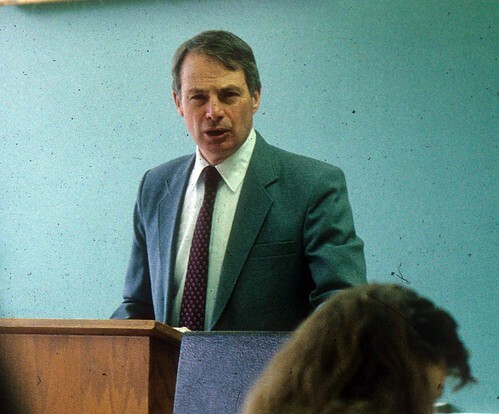 Scharfe taught mostly New Testament classes while at FWBC. His main courses were: Life of Christ, Gospel of John, Galatians, Prison Epistles, Hebrews, Hermeneutics, and New Testament Theology. When asked what his favorite memories of FWBC, he quickly responded, “…my classroom teaching was the highlight. 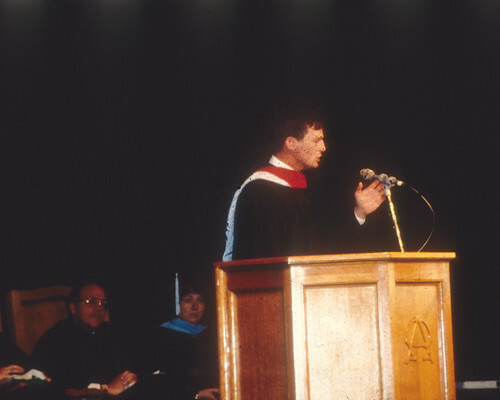 The relationships I was able to have with the students by God’s grace was certainly the most special to me ….and the friendships with many of the faculty and staff.” Rev. Scharfe left the College in 1992. He continued to teach as an associate faculty member at IPFW for ten years in the philosophy department, retiring in 2004. He continues today as a Pulpit Supply Minister in the Fort Wayne area, Ohio, Michigan, and Indiana. He has had opportunities to teach and preach in the Netherlands, Russia, Ukraine, Japan, Bermuda, and Jamaica. He humbly states, ”I am thankful that He (God) continues to open doors even today….” He enjoys running into former students and catching up on their lives in his supply pulpit ministry, visiting with his two grown children and seven grandchildren. Rev. 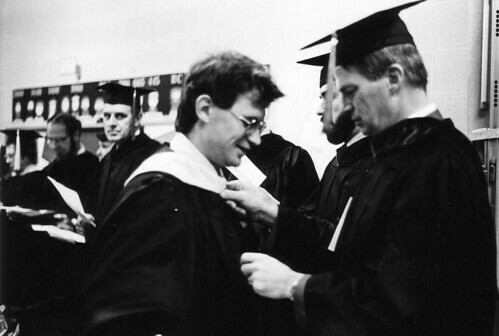 Ronald C. Scharfe served the campus from 1970-1992 in many capacities. However, the role he was most known for and loved by the students was Bible teacher. He was born and raised in Ottawa, Ontario, Canada. His higher education began in his hometown at Carleton University where he achieved a Bachelor of Arts degree with honors. He continued his education at Toronto Baptist Seminary, earning a Masters of Divinity, and then went to Westminster Theological Seminary for a Th.M. He continued his postgraduate work at Lutheran School of Theology in Chicago and Concordia Lutheran Seminary in Ft. Wayne. Rev. 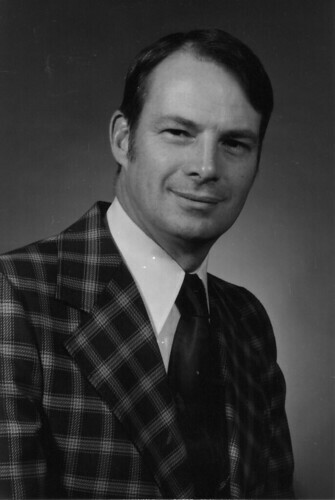 Scharfe served as a librarian assistant at a few colleges before receiving the call to come to Ft. Wayne Bible College in 1970 as head librarian. “That was God’s will, and I responded to God’s call,” he said. Although he has always been a “lover of books” and had enjoyed being a librarian, he had a longtime desire to teach. 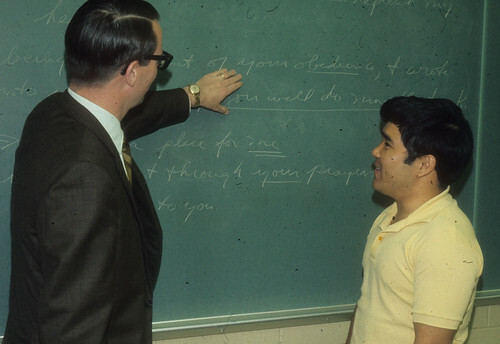 In 1973 he was asked to teach some Bible courses, and when asked to teach full time as assistant professor, that dream became reality. Rev. 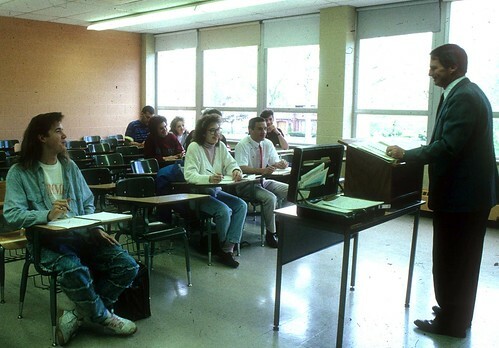 Scharfe taught mostly New Testament classes while at FWBC. His main courses were: Life of Christ, Gospel of John, Galatians, Prison Epistles, Hebrews, Hermeneutics, and New Testament Theology. Rev. Scharfe left FWBC in 1992. He continued to teach as an associate faculty member at IPFW for 10 years in the philosophy department and then retired in 2004. He continues today as a Pulpit Supply Minister in the Fort Wayne area, Ohio, Michigan, and Indiana. He has had opportunities to teach and preach in the Netherlands, Russia, Ukraine, Japan, Bermuda, and Jamaica. He humbly states, ”I am thankful that He (God) continues to open doors even today….” He enjoys running into former students and catching up on their lives in his supply pulpit ministry and visiting with his two grown children and seven grandchildren. Prof. Scharfe. You were my favorite teacher at Ft. Wayne. I always valued your Biblical teaching and the truth of Scriptural principles you taught. I also valued your friendship! I will remember the plane flight we took to Cleveland, Ohio from Ft. Wayne. You went to visit your mother and I was going to see my parents. We had a nice conversation. And then there was the time you hid my bike when I was frantically looking for it. What a delightful and personal professor you were. I will never forget the Book of Hebrews and the Pentateuch class. You're a good man! Prof Scharfe encouraged me to go on to seminary. At the time I felt Bible College was enough for a pastor. His encouragement motivated me to go on for further education. More importantly it motivated me to encourage my children to continue their education. Three of them have seminary degress and one is working toward a doctorate. He helped me to value an ongoing love of truth. I cannot begin to tell you how often over the past 25 years I have thought of you Prof Scharfe. His exegesis of the Epistle to Hebrews changed my life and minsitry. Rev. Scharfe classes were wonderful, as in wonderfully difficult, filled with writing lots of long papers! He was wonderfully funny, like when he would rattle off the longest and most difficult words, but when he got to a simple word, he would spell it! He will always be for me the personification of true humility. Thank you, Rev. Scharfe, for your enduring faithfulness to our Lord and Savior and His Word, whose knowledge, love, and goodness you instilled in your students. We have long since forgiven your one weakness ~ an aversion to reptiles, particularly small green rubber ones attached to the Nile River on your Bible teaching map."